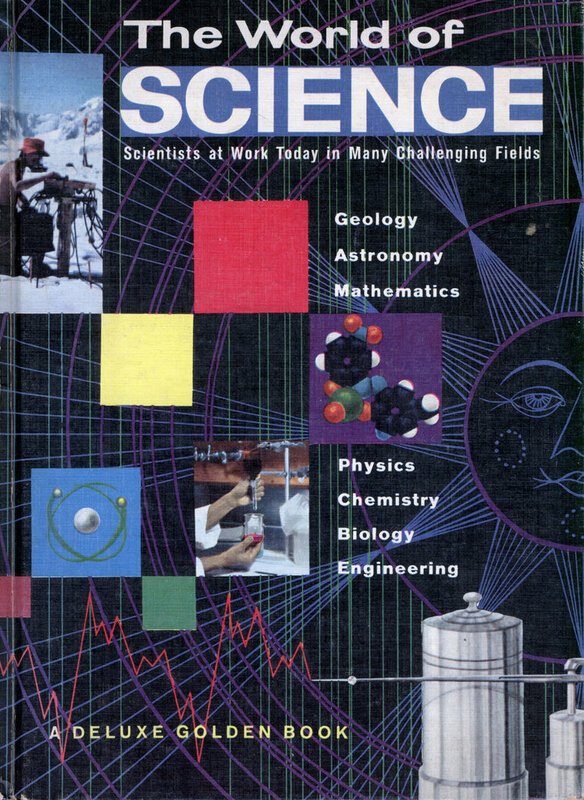 This is a chapter about information from a really cool text book called The World of Science, published by Golden Books in 1954. In the sound studio a singer is performing a popular number. The microphone suspended from overhead wires picks up the sound. If a whole group of musicians were being used, more microphones would be spaced about. In the control room at the back stands the sound engineer listening through earphones and turning dials on the crowded panels before him. Soon, as a result of this recording session, tens or hundreds of thousands of people will be able to flick on a phonograph and, wherever they are, hear this same singer with her guitar performing this same popular tune, as often as the hearer chooses to repeat it. Let us look at the steps between. The strings of the guitar and the voice of the singer set up sound waves. These sound waves press against the microphones. They are converted in the microphone At left, equipment for direct long-distance dialing. to electrical impulses. These electrical impulses are strengthened by amplifiers. And the amplified signal drives an electric head which magnetizes particles in the emulsion on a spool of magnetic tape. The tape is played back and redone until everyone is satisfied. Then it is played off once more. And this time the amplified electrical signal into which its sound is converted drives a hot electric cutting head. This head cuts grooves into a revolving disk of acetate-coated aluminum. This is the master recording disk. It is plated. And from the plate as many similar disks are pressed out as salesmen can sell. The purchaser lays the disk on the table of his phonograph. As the disk revolves, turned by electric power, he fits a needle point into the outermost spiral of grooves. The slight variations in the grooves wiggle a transducer which changes those small motions into an electrical signal. This small electrical signal has to be amplified, built up again. Then it is sent on to the loudspeaker, where the electrical energy is transformed again into sound waves, pressure waves which press against the hearer’s eardrums. Even that is not the end of the journey. The pressure against the eardrums is transformed into nerve pulses which run via relay centers to the brain. There the pulses are interpreted. Some hearers will hear the utmost in music. To others it will seem just a lot of meaningless noise. The basic pattern of steps in many forms of longdistance communication todayâ€”television, radio, telephoneâ€”is similar to the phonograph. Glancing back, you will see that the signals are being repeatedly changed into other forms. Hydroelectric generators convert water energy to electricity. Steam engines convert thermal (heat) energy to mechanical energy. Solar batteries convert light to electricity. Soon a nuclear battery may convert atomic energy directly to electricity. The light bulb converts electricity to light. The loudspeaker converts electricity to mechanical energy. Electric coils convert electricity to heat. There are many other transducers. The human body has a whole set of them. Light seen by the eye, sounds heard by the ear, odors smelled by the nose, touch felt by nerve endings, all are converted (by transducers) into nerve impulses and sent to the brain. Scientists and engineers have learned a lot about communication from studying the eye and the ear. Light and sound can now be communicated successfully by machines. But the mechanical basis of taste and smell is not yet understood. These have not been successfully imitated mechanically. And the human brain, with its complex system for storing and processing information, for transmitting that information and checking on whether it has been properly understoodâ€”all this remains largely a mystery, even to scientists. 5. switching, relaying, and transmitting it. If sending a message is to do any good, the message signal must be strong enough to be understood. This is where amplifiers come in. 2. A wire grid, which receives the tiny electric voltage variations carrying the voices and music. 3. A plate to which the boiled-off electrons from the cathode are attracted. The number of electrons ( â€”) which are at-tracted to the plate ( + ) (and go on to the loudspeaker to be converted back into sound) depends on the grid voltage. The voltage on the grid varies with the sound signal it carries. As this tiny voltage varies it attracts more or fewer electrons through the grid to the plate beyond. So the grid passes on to the plate in the form of electrons all its variations (its voice pattern). This current to the plate is much stronger than the original voice current. So now the voice pattern in a much strengthened (amplified) form is sent along its way. Why are these high frequencies so important? To answer this, we must take a look at waves. Sound waves on the other hand need some substance to travel through, because they are compression waves. They must have something to compress. Sound waves travel rather slowly, around 1100 feet per second in air, while electromagnetic waves all travel at the familiar speed of light-186,000 miles per second or 30,000,000,000 (3 X 10^10) centimeters per second. This, of course, is why in a thunderstorm we see the lightning sometimes several seconds before the slower thunder beats against our eardrums. 30,000,000,000 (cm per sec.) /10,000 (cm) = 3,000,000 cps. The frequency of a sound wave we hear as pitch. The lower the frequency (the longer the wavelength) the lower the pitch is. The human ear can hear quite a range of frequencies or variety of pitches, from as low as 20 cycles per second to as high as 20,000. Most people cannot hear this whole range. Men in general hear the lower frequencies better than women; women usually hear high frequencies better than men. This leads to disagreements in many homes over high-fidelity (hi-fi) phonographs. If a set amplifies the high-pitch sounds to suit the men, they are likely to sound screechy to the women. A good hi-fi system may have a range of 40 to 15,000 cps. Some records have ranges of 30 to 18,000. But these are sound waves. All our longdistance communication systemsâ€”telephone, radio, television, telegraphâ€”use electromagnetic waves instead. And, as you can see on the chart, if you go into the microwaves (less than one centimeter in wavelength), frequencies go higher than thirty billion cycles per second. That is where present-day research is centered â€”in the high-frequency microwaves. You have a message for someone who lives many miles away. You want him to have it at once. Chances are you will telephone. So many millions of people use long distance telephone service today that it keeps a large research staff busy working at top speed to keep expanding and improving the service. The first telephones, much less than a hundred years ago, had a microphone (transducer) which converted sound waves into electricity. This electricity went directly through a wire to the receiver, where another transducer in the receiver converted it back into sound waves. There had to be a pair of wires to close the circuit and keep the electricity flowing. This kind of system worked for a distance of ten to twenty miles. But beyond that there was loss of power and distortion of sound. You could scarcely hear through the receiver, and what you did hear was hard to understand. Then in came amplifiers. In a telephone system they are called repeater stations. Every twenty miles or so the current goes through a repeater station which strengthens the signal. When telephone wires had spanned most countries, demand for trans-oceanic service began to grow. So cables have now been laid along the ocean floor, all across the Atlantic. And repeater stations were built into the cable. Every few miles the cable bulges like a snake that has just swallowed its breakfast. Each bulge marks another repeater station to step up the power of the signal traveling thousands of miles in an instant to come out as a familiar voice. In early telephone systems each loop of wire carried one message and only one. If modern systems, with their hundreds of thousands of calls per hour, had to have a wire for every call, think how thick those ropes of wires would be! A way had to be found for sending many messages through a single wire or cable at one time, still keeping them separate so they could all be sorted out again. The method which has been worked out is called carrier modulation. A diagram of electric current or sound waves would look the same. The carrier wave is put into a modulator. There the voice signal above is made to vary the amplitude (height) of the carrier wave. So the carrier wave takes on the pattern (or amplitude) of the voice signal, like the one in the next column. The high-frequency wave now carries the voice pattern. At the other end of the line a reverse process separates the two patterns again, and the voice signal comes out through the receiver as sound waves. The high-frequency range includes a spread of billions of cycles per second. So allowing a band of around 3000 cps to each message, there is still plenty of room for many messages side by side on the same wire at the same time. At the receiver end there is a filter which blocks out all frequencies but one particular band or signal. One telephone wire can now carry about a hundred separate messages at a time. A coaxial cable may carry 1800 or more. As population grows and demands for telephone service increase, engineers are being challenged to increase the carrying power of cables and to make use of higher and higher frequencies. The chart of wavelengths on the endpapers shows how crowded with messages some frequency bands already are. Radio broadcasts extend from 0.5 megacycle per second to 1.5 megacycles per second. (A megacycle is a million cycles!) Above that lie police and other special radio bands. Between 10 and 30 megacycles are the short-wave frequencies used for trans-oceanic telephone and telegraph. Around 50 megacycles are the TV channels; above 100 megacycles are FM broadcasts; and other TV channels extend up to 200 megacycles. Beyond that there are bands of frequencies vastly wide, waiting to be used. One problem at high frequencies is that ordinary vacuum tubes do not amplify such signals well. Above 500 megacycles per second, the motion of the electrons cannot be changed fast enough, and electric current is too sluggish for accuracy. Noise gets into the signals then and makes them hard to understand. Research engineers have made great progress in solving the problem of high-frequency amplifiers. But many men are still at work, because vacuum tubes are so vital in so many fields of modern researchâ€”in nuclear physics, microwave spectroscopy, radio astronomy, and many other fields where delicate instruments pick up very faint but extremely important signals. One way to increase efficiency at high frequency is to cut down the distance the electrons must travel. If the size of the tube is halved each time the frequency is doubled, the tube can be kept very efficient. But as frequencies go up, the size of the tube gets so tiny that it is in danger of disappearing entirely. To operate at a frequency of 4000 megacycles, the tube must have a grid made of wires 1/10 the diameter of a human hair, strung 1000 to the inch. The cathode will be 3/16 inch in diameter, about 1/2000 inch from the grid. These are difficult dimensions to handle in construction, as you may imagine. The engineers have tried every variation they could think of. They have worked out means of speeding up the electrons so they could travel farther in a fraction of a wave cycle. This gave them the klystron amplifier, used in ultra-high-frequency television transmitters. It can produce enough energy to bounce signals off the moon. They also produced a kind of tube called a magnetron, which is widely used for generating radar pulses. Still there were problems. All these amplifiers worked only for a relatively narrow band of frequencies at a time. How could they be made to amplify a wide band of frequencies at once? The traveling wave tube seems to be the answer to this. In it the electrons are sent a longish distance. But they travel through a coiled wire, a helix, which carries an electromagnetic wave. This increases the power of the electrons immensely. Traveling-wave tubes have been built which can amplify bands of frequencies several thousand of megacycles wide. A glance at the chart on the front endpapers will show you that this band width could include huge numbers of telephone and television channels as well. 1. They introduce very little noise. 2. They can be made to amplify a signal to very great power, so it can be sent a very long distance. 3. They can amplify many signals at a time. 4. And they have opened up a vast new range of frequencies in the microwaves. These waves have such short wavelengths (less than one centimeter ) that their frequencies are correspondingly extremely high. They open up what seems to us now to be an inexhaustible range of newly accessible frequencies. But there will be new demands too. A television broadcast takes a band 6,000,000 cycles wide, as against about 3000 for a telephone conversation. And person-to-person television seems just around the corner. That may soon fill up a vast range of frequencies. In vacuum tubes of all types, electrons are made to travel through space. But a few years ago scientists found that electrons travel about, even in solid materials. In some solid materials, crystals, the atoms are put together in regular patterns. And it was found that in these crystals electrons can travel freely in waves of certain frequencies, without interference from the atoms. Scientists plotted these wave motions and worked out an amplifier in which there is no heated cathode, no wire grid, no vacuum, no plate. There is just a bit of germanium or silicon the size of a pencil point with three or more tiny electrical connections to it. The signal comes in; an electric current sets electrons in motion, and through their motion the signal is tremendously amplified. Transistors, as these tiny amplifiers are called, have special value because of their small size and weight and low power consumption. They can be fitted, for example, into very small hearing aids and amplify sound signals there. They can be operated on the power of a tiny batteryâ€”as little as 1/100,000 of a watt. Within their range they are very efficient. And they have the promise of long life. But so far they do not operate well at high frequencies. Research men are busy trying to extend their range in this direction. Also the transistors are not yet very consistent. Manufacturers are trying hard to improve them so that a standard will be reached and each one made will be just like every other one. You know the particles within atoms are always in motion. These natural internal motions of any one type of atom have a certain frequency. This frequency is so stable that it varies only one part in 100 billion. The property of atoms and molecules to emit and absorb electromagnetic energy at these stable frequencies is the basis of the Maser. The atoms (of gas or crystal) are first “primed” by one of several methods. Then a small microwave signal is used to trigger the atoms into emitting their natural radiation. When there is no triggering signal, the Maser produces no signal at all. There is no background noise, as with vacuum tubes. This is a great advantage of Masers over other devices. Let us think of the vast telephone system which forms a spider-web of communication over our whole continent. The system includes millions of individual wire loops connecting telephones with local exchanges. It includes hundreds of thousands of wires carrying a number of messages at a time between exchanges. It includes thousands of cables carrying hundreds of messages at a time over long distances, stepped up in power every twenty miles or so by vacuum tubes in relay stations. And the system includes at least two transcontinental radio lanes along which signals are beamed through the atmosphere without wire or wave guide. (Some microwaves are transmitted through hollow tubes called wave guides.) An antenna at the sending end shoots out its signalsâ€”not broadcast, but carefully narrowed into a directional beam. About a hundred miles away (more or less, depending on the kind of countryside) the antenna of a repeater station picks up this signal. Here it is amplified by a klystron, traveling-wave tube, or vacuum tube and sent on its way. These radio lanes have the advantage of saving the expense of installing and maintaining an elaborate system of wires. They have the disadvantage of being affected by weather along the route. The systems engineer must balance advantages and limitations of all kinds of equipment in this way. He must be conversant too with all the research projects under way in attempts to solve his problems. One big problem in every kind of communication is noise or interference. Surely you have been in a group so noisy that you couldn’t hear what anyone said. The sounds were loud enough, but they were interfering with each other, and so could not be understood. Even a smoke signal may be interfered with by “noise.” In this case, the noise would be a cloudy sky which would make the signal hard to see. A jungle drum signal might be interfered with by the noise of workmen hammering. In radio astronomy, as you may recall from page 59, there is always background noise being received. The signal from distant hydrogen clouds is so faint in this background sky “noise” that an observer must have several long signals to compare to make sure he is really catching the hydrogen signal. Vadium tubes may develop noise (“static”) as they build up a signal, so that the message is hard to understand. Or filters may not completely sep-arate two frequencies, so that there is some confusion of messages. All these are problems of the systems engineer. And they have led to a study of what really makes up a message. This study is called information or communication theory. Our speech is not a very efficient way of giving messages. In conversation we waste a great many words. This does not matter when we are talk-ing with someone who is in the same room and we both have a lot of time. In fact, we sometimes do this for amusement. But there are times and circumstances when it is important to be efficient in giving a message. Condensing speech is just one step, though. “We’d like to condense the whole process of running want ads,” says a newspaper man. “Look at all the steps: The advertiser telephones in the information. An ad taker puts it into condensed language and types it up. A linotype operator sets the typewritten copy up in metal type. A paper mat is made from the metal type. The mat is plated up into a page. And the newspaper is printed from the plates. Then the business office has to type up a bill for the advertiser and keep a record of the billing. The telephone company does have a system for transmitting information directly from a computer’s magnetic tape over the telephone. You will recall (from page 78) that a computer can take instructions only in the form of holes in cards or magnetized spots on tape. There are just two signals in its codeâ€”1 and 0. At each point on a punch card either there is a hole or there is none. A spot on tape is magnetized or it is not. There could be quite a lot of “noise” or interference with this signal and it would still be clear that this meant 1 0 1 0 1. In the computer code described on page 77, this pattern would give you the number 21. This method can transmit 600 “bits” per second, the equivalent of 800 words per minute. This is about ten times as fast as the teletype-writer or telegraph. 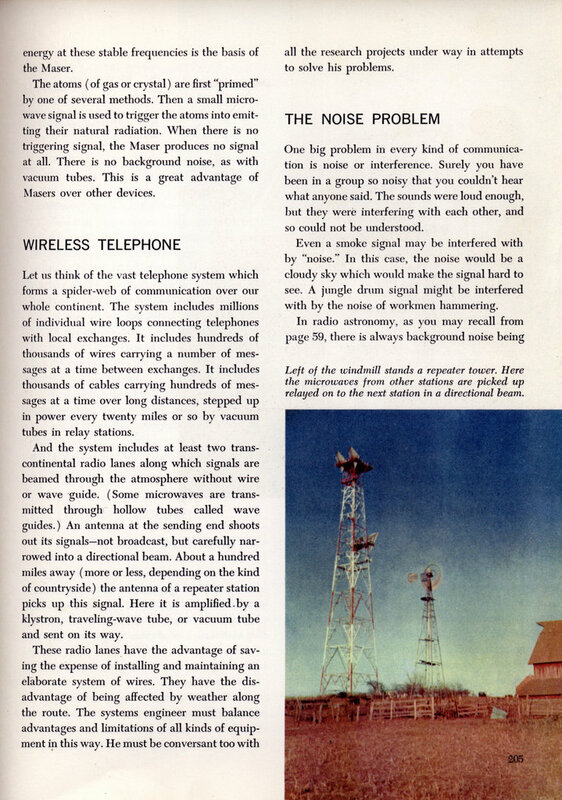 Another method already in operation for send-ing computer information by telephone uses equipment called the recorded carrier. Before putting in your telephone call, you feed your information onto a magnetic tape recorder. Then you put through a regular long distance call; and when the other party is ready to receive, you turn on your tape recorder. Of course the message is transmitted backwards, but who cares? When it is wound up on the tape recorder at the receiving end, it will be all set to play off in the right order. Then the information can be converted from tones back to magnetized spots on computer tape. The input by this method is slowerâ€”75 “bits” per second. But it can be transmitted at eight times this speed, which brings it up to the digital sub set in efficiency. In this code, our signal 10 101 would stand for U, the twenty-first letter of the alphabet. They divide up the range of the voice into just six or seven numbered bands. They sample the pattern, let’s say a thousand times a second, and note in which band the voice is pitched each time. Then they send out just the list of band numbers. At the receiving end, these numbers are converted back into the sound ranges they stand for. And out comes a sound pattern enough like the original speech to be understood. Simplified ways to send messages by machine are becoming very important. For the big movement in modern business is toward systems in which machines do all the routine jobs now done by human workers. This means that a great deal of information must be communicated from one machine to another. This development is called automation. Some people speak of it as a Second Industrial Revolution. Little more than a hundred years ago, the steam engine was put to work to provide man for the first time with practically unlimited amounts of energy. Man put the steam engine on wheels and travel began to speed up. He attached the steam engine to looms for weaving cloth and to spinning wheels, and work began to speed up. Because these machines were too large for homes, factories began to be built. And on came the Industrial Revolution. Soon man’s arms and legs and back no longer had to provide the power for much of the work of the world. But man’s brain still had to control the machines doing the work. He had to start them and guide them and stop them. He had to judge their work and correct errors. His eyes, ears, and sense of touch did the observing. His brain interpreted their information. And his muscles made the machines respond. Now in automation, machines replace man’s eyes and ears and sense of touch. Machines replace man’s brain in judging the quality of the work, keeping track of the marketing, even in planning how much work should be done. And machines replace all but a little of man’s muscular control of the machines. Sometimes it is at a routine task that a machine replaces a man. Much of the steering of big ships and planes is now done automatically, with controls set to respond to any change in direction. firing. Engineers who have developed these computers feel that by 1965 there will probably be few fighter pilots left. Perhaps it will not be much longer before some of the super highways being planned will have automatic control lanes. On these, drivers of properly equipped cars will be able to switch their cars to automatic pilots. And radar and sonar will keep the cars from bumping other vehicles or from going too close to the edges of the lane. As in every communication problem, the elements would be the familiar ones. There would have to be a sensing device (possibly a compass needle) to check the car’s direction. When an error in course occured an electrical signal would be set up (the familiar transducer). This tiny pulse would have to be amplified as usual. And the more powerful signal could be used to turn the wheels of the car. Also strong guiding signals might come from equipment along the road or from buried guide cables or magnetic “tapes” painted on the highway. Here is a huge, light, busy factory. Machines whir and hum. But there are no voices to be heard. No workers move about among the machines. Up in a small control room two men are on duty, keeping watch. But in the main the lonely factory runs itself. It is fashioning machine tools from raw steel ingots. Huge rollers set to exact thickness flatten the ingots into sheets. Three dimensional sensing devices “read” patterns for parts. Transducers convert this information into electrical energy. Amplifiers build up that energy so that it can run machines to shape, drill, and fasten together the parts. As many as a thousand different individual machining operations may all be done mechanically. And they are all supervised by machines. Amplifiers can sense and correct tiny changes in speed or voltage which could cause errors. Photo tubes can convert light into signals which count, sort, check defects, and judge quality. All the things human operators would have done, machines do now. Parts are swung or slid or rolled into place for the next step automatically. But, you may say, this has been done for a long time on assembly lines in many factories. That is true. In fact, in most factory automation most of the individual steps are familiar. The new thing is the size and completeness of the system. These systems are described by the term “a closed loop.” This means that instead of feeding raw parts into one end of the factory and carting away finished products from the other end (an open loop) you have machines (computers) which also keep track of supplies on hand, of use of parts, of incoming purchases, and sales of finished products. This information closes the loop of automation. For it tells the machines how much to produce and checks the output. This kind of control is called feedback. The challenge for engineers in automation today is putting existing devices together into these systems which can largely run themselves, and controlling that running so that they operate at a profit. There is even talk of machines which will be able to repair and reproduce themselves. What will become of the men and women whose life work has been the supervision and operation of machines? Will they and their families starve? No, say the engineers. In the first place, automation will be practical only for large-scale manufacturing plants, offices, and stores where the same sort of routine operation is done over and over again. For many, many smaller businesses, especially where planning, imagination, and ingenuity are needed, the human touch will still be in control. Also, engineers point out that the more we have, the more we want. As basic necessities are produced and distributed increasingly by automation, new needs and desires will develop. People working fewer hours and having more leisure will want more equipment for their hobbies and sports, all their recreational interests. And these new wants will help make new jobs for many people. Most working people today are employed at jobs which had never been heard of before the first Industrial Revolution. It seems reasonable to suppose that you and many of your friends will find yourselves as grownups working at jobs which have not been dreamed of today. But will people have too much leisure? Will they know what to do with all their free time? That is a real challenge. The answer lies in human beings themselves. We humans are more than just machines which must be fed and kept in condition so we can turn out work. We are individuals, each one different, with minds of such wondrous complexity that not even scientists who have spent a lifetime in study can begin to understand their workings. These minds of ours have capacities few of us ever begin to explore, for enjoying truth and beauty in countless forms. They have sensitivities of feeling so mysterious and marvelous that in awe and wonder we give them a special name, the soul. Men of science and engineers have learned to use the earth’s varied resources. They harness the rivers to give us light and power, tame the waves of the air to carry our messages, turn the trees of the forests into papers and books. The vast resource we still let go to waste is the power of human minds to think keenly and to feel deeply, to dream and to plan and to work together for the enriching of all human life. If you as a scientist or engineer of tomorrow can lead men in that direction, your name will go down in history as a great benefactor of mankind. That first page, it’s a #5 Crossbar switch used by the Bell System.